UPDATE 2015: This oven just broke down after only three years. It was great while it lasted although breads didn't turn out as well. After suffering a few months, we finally got an oven! It's a hit to the wallet, but it is a beauty. Here's a quick, unedited shot from my aged iPhone 3Gs - which would have seen an upgrade to the 4S, if not for my budget being eaten up by this oven. But! 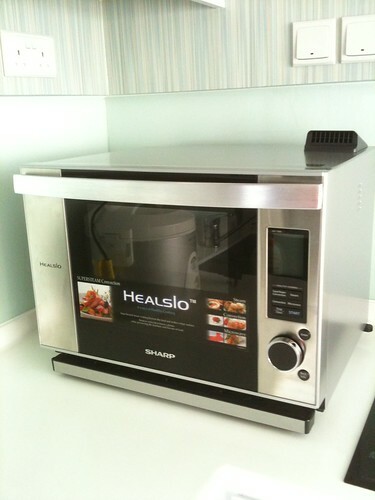 The Sharp Healsio can bake, grill, roast, steam, microwave and even proof bread! I think I need this more than a better phone. You can cook stuff with superheated steam (literally a very hot colourless air). Like air-fry stuff, without oil. Yes, it gets things crispy...well, crispy enough. So here's to healthier eating in 2012. And since it can inject steam into the oven, I'm hoping it won't spoil like my old Rowenta when I put water in to bake bread. Oh well. Breaking in starts today. Fingers crossed. Anyone else has this oven and can share their experience? From what little I've read, everyone who has this oven just raves about it. P.S. I never thought the name Healsio was appealing, but I learned recently it is an approximation of the Japanese phrase for "reducing salt" (that explains the "sio" or shio). Well, that's one of its features. Reducing salt, and fat too. Well, I don't always want to remove fat from my food (especially omega-3 oils!) but I suppose my weighing machine will thank the oven for it. air-fry stuff, too! omg... In my dreams I want a air-fryer so no handling of oil. We're looking for an oven, still shopping around after half a year... This sounds so so so charming being all in one! Out of curiosity, what is the maximum temperature it can reach? Ohh lovely! I wonder if I can get this in Kl, Msia?? I like baking too, but find it hard to get an oven that bakes bread. This is which model. After a long and similar wait (for more than an year), I am about to get mine. AX1300VI(S). Which model is this one? hi...after more than 3 years using this oven, how would you rate and review it? im looking for which superheated steam oven to buy. your opinion on this one is very much appriciated. thanks! Well, funny you asked, because this oven just broke down. It was great for roasts and moist cakes, but I have to say I wasn't too impressed overall. My breads didn't turn out too well. My old Rowenta was better for baking. So I've gone back to Rowenta for now. I should do a blog post. We bought the sharp Healsio Water Oven in 2010, first broke down in 2013, after 3 years of use and now broke down again. Any recommendation for a good microwave for replacement? Actually I rarely used the microwave function of my Healsio oven. I do have a separate Sharp microwave that has lasted for years (I think it came free with my fridge or something). Maybe the single-function machines work better. These combi-types may be more likely to break down.